• Vera Lynn show [sound recording]: BBC radio broadcasts of 1958 with Eric Robinson & His BBC Orchestra. Physical Description • 3 v. (6 sound discs (CD) : digital, stereo. David Hansell visited the GEORGE MALCOLM ARCHIVE at Oxford's Balliol College in November, 2013. 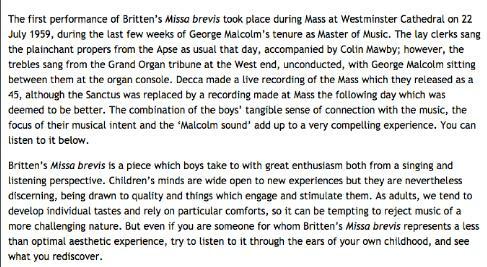 He wrote a report on his visit for Early Music Review and has kindly allowed its reproduction here. When Thomas Goff started to make harpsichords in the early 1950s, awareness and knowledge of the traditional methods of designing and making keyboard instruments had scarcely begun, and Goff started working almost by himself. He had left a legal career at the Bar to learn harpsichord making from Herbert Lambert, who had added amateur harpsichord making to his profession of photography. 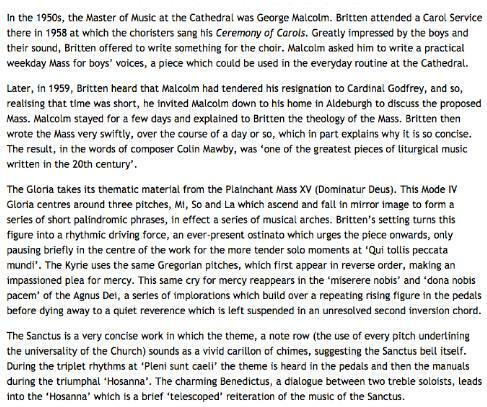 Goff followed Lambert's ideas fairly closely, basing his instruments loosely on Kirckman's later work. He brought to it such modern knowledge and techniques as he felt to be appropriate, but did not do much research himself or make many experiments. Thomas Goff was distantly related to the Royal Family and was obviously fairly well-off. He lived in a huge red-brick terrace house at 46 Pont Street, near fashionable Sloane Square in London, with his butler who resided in the basement. The high Edwardian rooms on the ground floor of the house were full of his harpsichords, which he rarely sold, though he hired them out for concerts. Above that, the middle floors were often let - Lord Waldegrave and his family lived there at one time. And then, right at the top, in two floors of attics, for the Pont Street houses are somewhat Dutch in design, he had his workshop scattered over several rooms. One room for himself, one for his cabinet maker, Cobby, one for passing helpers or students, one for polishing, one for storage. Cobby - he was always called by his surname - was a genuine salaried highly-skilled craftsman of great experience who worked with Goff for many years. He did all the cabinet making, always insisting on only the highest standards of work. He could distinguish a true right-angle, 90°, from a corner of 89° or 91° with a touch of his finger and thumb. His instrument cases were always expertly made with great economy of time, effort and words. Goff himself, though highly skilled as a cabinet-maker, generally concerned himself with the actions, stringing, tuning and voicing. He played very well, both technically and in the sense that he "felt" the music he was playing; the present writer still remembers with affection a magical performance by Thomas Goff of Bach's Chromatic Fantasy. Goff filled his house with musicians, many of whom came regularly to practice. He was not an adventurous maker, he made only three sorts of instrument - a large double-manual harpsichord with a metal frame, a small double-strung chromatic clavichord, and a very small single-strung chromatic clavichord. The decoration varied but not the instruments. Indeed he sought to maintain a high unvarying standard. And to do this he used, for example, a lot of metal templates in the construction. The smallest clavichords had a thin tone and few were made. The larger clavichords were very successful, sounded well and were made in some quantity; they had a pressure plate over the strings and a fairly thick piano-style soundboard barred straight across underneath. The harpsichords, made with pedals, were very complicated, all registers being capable of half as well as full engagement, but they produced relatively little volume for such large instruments. One of London's Great Events during the early 1960s was the "Thomas Goff Circus" held each year at the Royal Festival Hall. Four Goff harpsichords were lined up on the stage, with harpsichordists Thurston Dart, George Malcolm, Valda Aveling, Geoffrey Parsons and Simon Preston variously taking part. The harpsichordists had enormous fun, bobbing and nodding between themselves while orchestra and conductor struggled to keep pace with them. 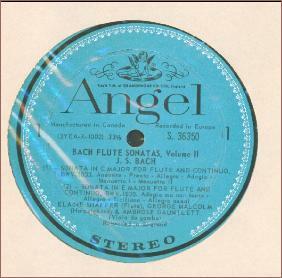 The repertoire always included Bach's Concertos for 3 and 4 harpsichords, with perhaps the CPE Bach for 2 harpsichords. George Malcolm's Variations on a Theme of Mozart, also performed during these concerts, were composed especially for Thomas Goff's instruments, to show some fascinating examples of modern stop-changing, including the use of the lute-stop (produced with a damping mechanism), quills, leathers, 8-foot and 4-foot tone. Thomas Goff's instruments were equipped with anything from 2 to 7 foot-pedals for use in making quick registrations. Stops could also be "half drawn", allowing subtle changes of volume. Roy Plomley's castaway is harpsichordist and conductor George Malcolm. 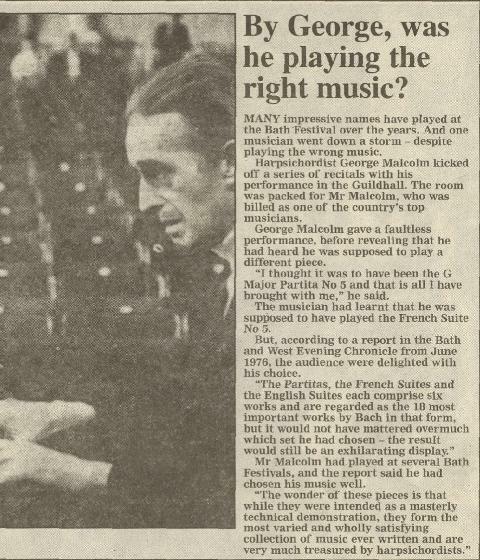 14/6/1977- Aldeburgh Festival, Snape Maltings. The work was completed in September 1965 and premièred at the Camden Festival in March, 1966 by George Malcolm, conducted by the composer,.Since then performances have followed in various towns in England, the Belfast Festival, the Vancouver Festival during Expo, and in South Africa and Israel on the radio and in public.In July 1966 the work won the second prize in the international competition for "Musica ritmo-sinfonica" at Salerno in Italy where it was performed by the Brno Philharmonic.The work is dedicated to George Malcolm who has just returned from Sweden where he performed it with the Göteborg Symphony. One of Jennifer Vyvyan's Desert Island Discs in 1966 was Rimsky-Korsakov's Flight of the bumble-bee. Soloist: George Malcolm. 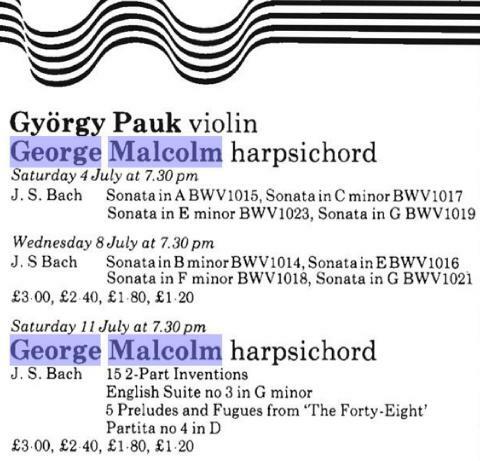 Anthony Burgess chose George Malcolm playing the Goldberg Variations (No.13) as part of his selection in 1966. 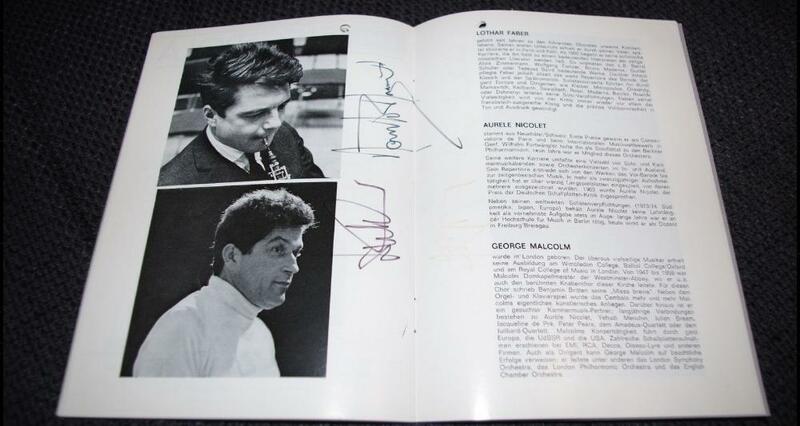 Sir Richard Woolley also chose George playing the Goldberg Variations (No.30) among his selection in 1965. 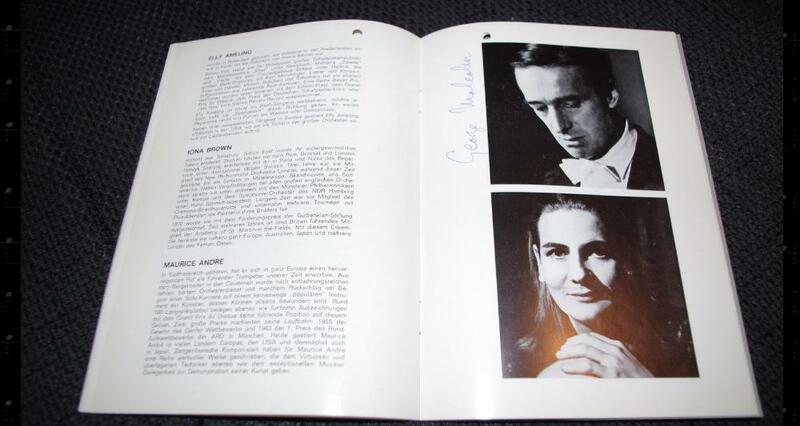 Ngaio Marsh's favourite in 1968 was Bach's Fifth Brandenburg Concerto with George Malcolm, Menuhin and the Bath Festival Chamber Orch. Janet Baker (1968), Ravi Shankar (1971), Flanders & Swann (1958) and Peter Pears (1969) all chose George playing Scarlatti Sonatas. Sir John Rothstein chose George's Victoria recording in 1965. 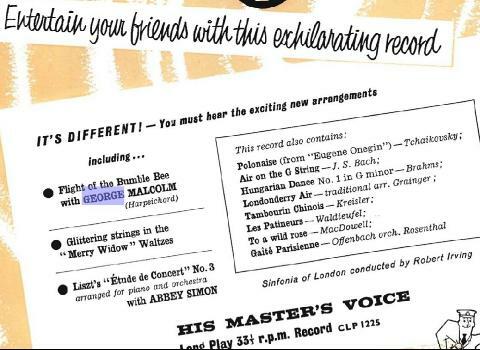 Steve Race chose George's Gelineau Psalm recording in 1959. 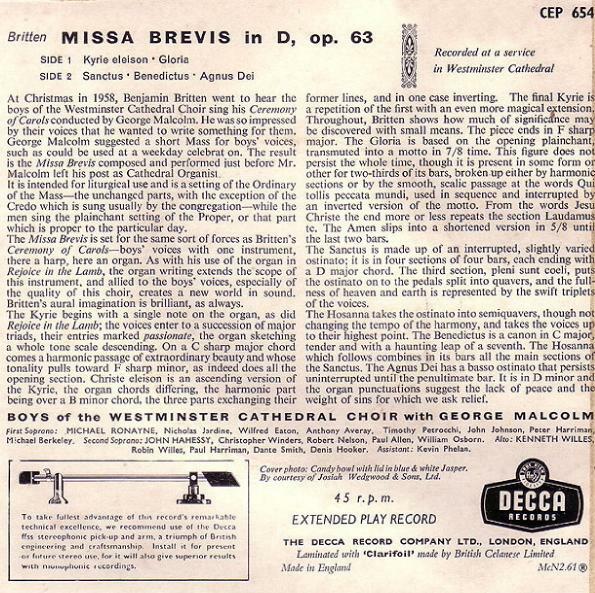 Sir Nicholas Jackson who was Organist and Master of the Choristers at St Davids Cathedral in Wales from 1977-1984 has achieved increasing distinction by the diversity of his activities as an organist, harpsichordist and composer. 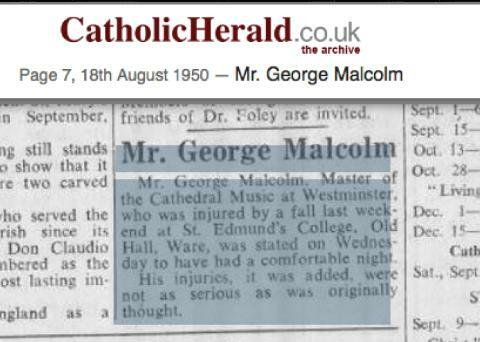 He was an Organ Scholar at Wadham College, Oxford and a studied the organ at the Royal Academy of Music with C.H.Trevor and the harpsichord with George Malcolm. He later studied both instruments with Gustav Leonhardt in Amsterdam and had conducting lessons with Sir Adrian Boult. Throughout his career, clarinettist Andrew Marriner has performed with chamber ensembles around the world, including the Chilingirian, Lindsay, Endellion, Moscow, Warsaw, Orlando, Saccone and Belcea string quartets, as well as being a member of the LSO’s chamber ensemble. He has performed with some of the most distinguished figures in the world of chamber music, among them Alfred Brendel, André Previn, Andras Schiff, Lynn Harrell, Stephen Isserlis, Emanuel Ax, Hélène Grimaud, Sylvia McNair and Edita Gruberova, as well as the late Vlado Perlemuter and George Malcolm. In her 20s and 30s Bette pursued a career as a solo and ensemble singer, performing in the Queen Elizabeth Hall and a subsequent BBC broadcast, and in variety of roles in opera, light opera and oratorio. A student of Pamela Cook, in 1976 she took part as a soloist in Bach masterclasses with Peter Pears, George Malcolm, John Carol Case and Imogen Holst at the Britten-Pears School for Advanced Musical Studies. Following her return to the United States in 1978, she continued her studies at the University of Michigan and the University of Illinois. As a recitalist soprano Jennifer Smith enjoys a distinguished reputation. She has performed in Portugal, France, Germany, Switzerland, Belgium and Spain as well as Britain. Several of her recitals have been broadcast by the BBC and she has recorded Schubert Lieder for HMV Lisbon. In 1994 she took part in Andras Schiff's festival at Mondsee, devoted to Mozart and Debussy, having also given a recital with him in Cologne in 'Finale - Ein Kammermusikfestival' in 1993. 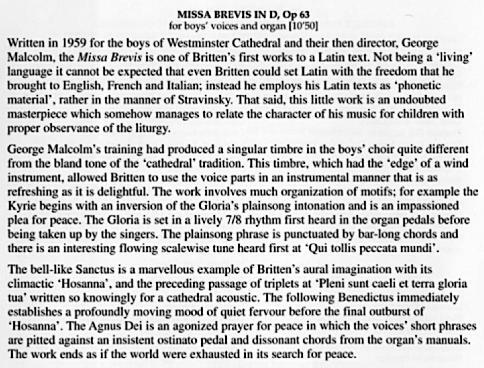 Jennifer Smith's television appearances have included Scarlatti's Salve Regina with the late George Malcolm; Handel's Judas Maccabaeus with Roger Norrington; Purcell's Come, ye sons of Art for the BBC, and Vivaldi's Gloria in the series 'Christmas in Rome' with the English Consort, shown on BBC television at Christmas 1993. She was also a featured soloist in a film about Henry Purcell, directed by Tony Palmer and shown on British television in 1995. ROBERT GOBLE (1903 - 1991) was a builder of harpsichords and clavichords who worked with Arnold Dolmetsch for twelve years before setting up his own workshop in Oxford, England in 1937. His instruments, known for their quality and reliability, were found throughout Europe. 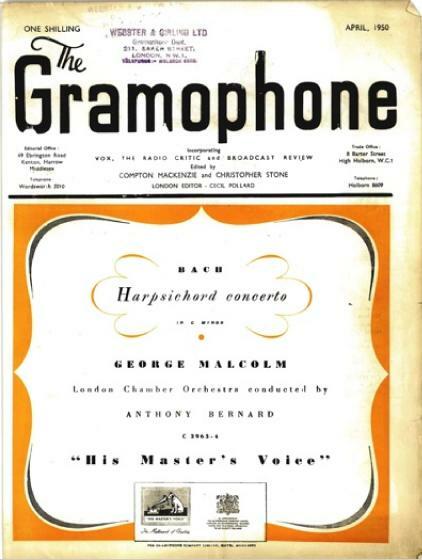 George Malcolm claimed it as his favorite harpsichord and used it for many recordings, including a solo Bach recital and series of Bach concertos for EMI, as well as his Decca recording of concertos by J. C. Bach and Haydn. 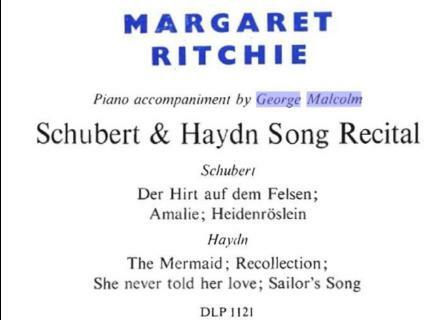 Other notable recordings include Raymond Leppard's complete traversal of Bach's harpsichord concertos for Philips and Genoveva Gálvez's many solo recordings for the Spanish label Hispavox, including the first integral set of Soler's quintets. The Goble workshop continues to operate today, offering historical instruments. THOMAS GOFF (1898 -1975) was a London builder of clavichords and harpsichords. He built only one type of harpsichord: a large two-manual instrument, elaborately veneered, with a complicated action that offered the performer some control over dynamics through the use of pedals. Goff sold few of these instruments, preferring to keep them as rentals. The Goff harpsichord, with its unique and immediately identifiable sound, became well-known through Thurston Dart's many L'Oiseau-Lyre recordings, Valda Aveling's famous Scarlatti recital for RCA, and George Malcolm's popular Decca recordings. 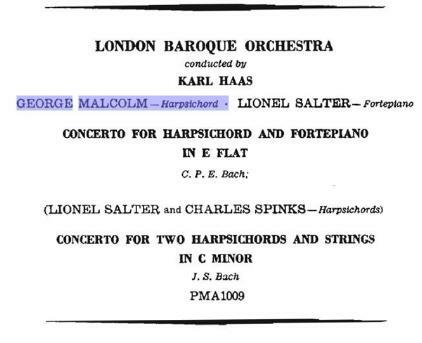 Composed specifically for Goff harpsichords, Malcolm's Variations on a Theme by Mozart was often performed at the annual concerts of music for four harpsichords held at London's Royal Festival Hall during the 1950s and 60s.